The three available blades, stiletto, small blade, and large blade, are shown in the left photo above. 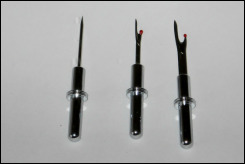 There are also needle threader tools available, shown on the right: large is .005" diameter wire, fine is .003" diameter wire. Quilters love these rippers! The seam ripper is used by seamstresses to remove stitches, open seams, cut threads and open buttonholes. 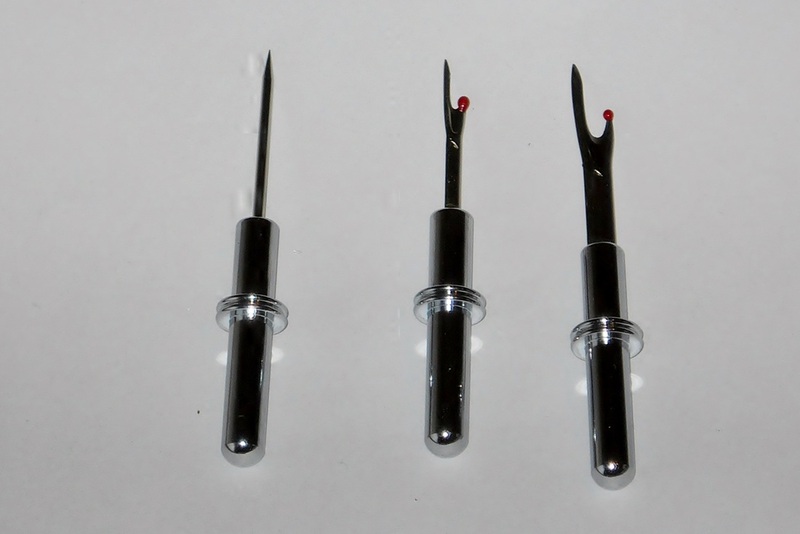 This version is made specifically for quilters, with a small blade in one end and a stiletto in the other. The blades are removable and reversible for storage and protection. Replacement blades are available if you lose or damage one and a larger ripper bade is available as an option. The fittings and blade mounts are chrome plated. The wooden or resin section is hand turned and sanded. A cyanoacrylate finish is applied in multiple layers and then sanded and polished to a high gloss. But these rippers are made to be used, not just admired, and they must be held in the hand for the balance to be fully appreciated.